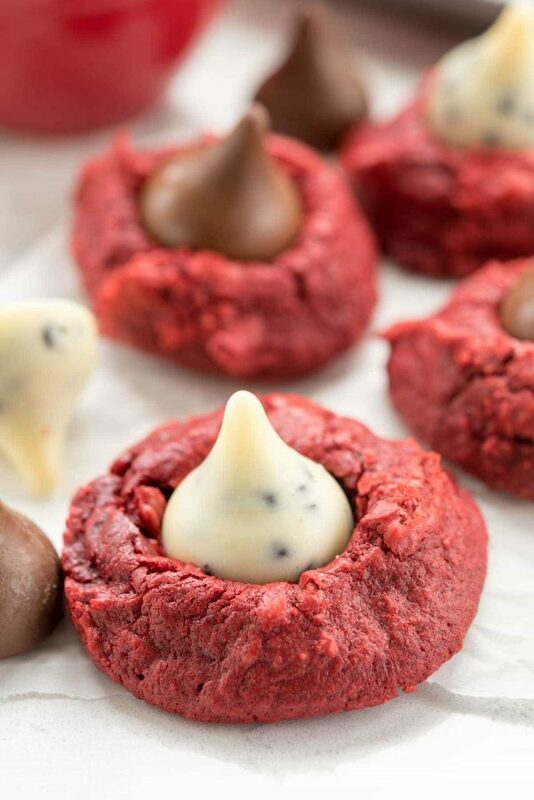 Make Valentine’s Brownie Cookies for your valentine! 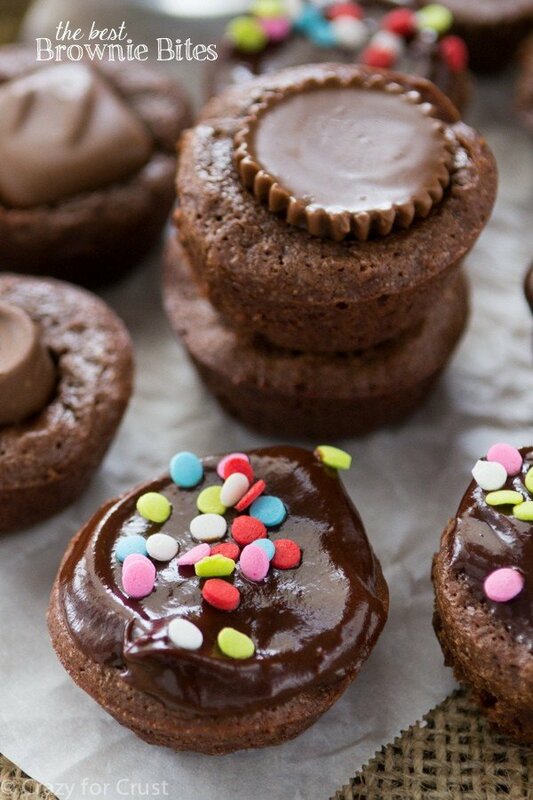 These are fudgy flourless brownie cookies full of extra chocolate and have just a few easy ingredients. 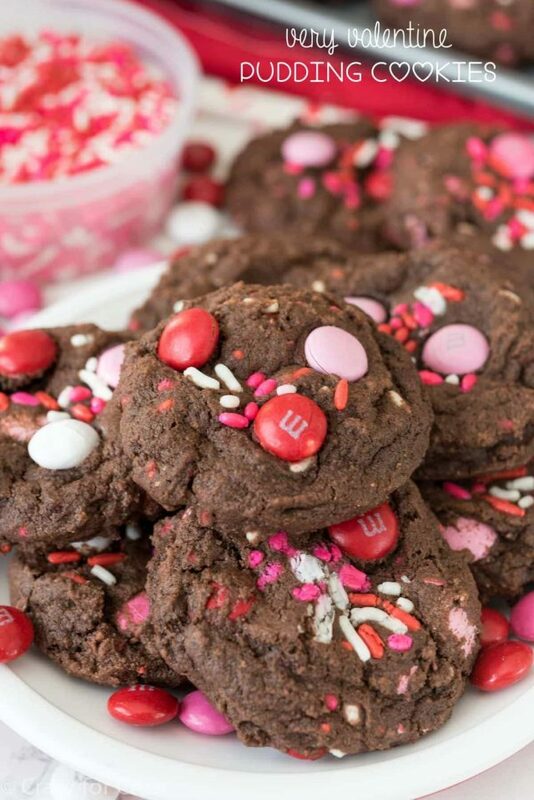 Because they’re super chocolatey, they’re the perfect Valentine’s Day treat. Only chocoholics need apply for these cookies – but make sure you have a nice tall glass of milk to wash them down with. Eating one of these cookies is like eating a fudgy brownie in cookie form! I knew it was February but it hadn’t dawned on me how close Valentine’s Day was until that moment. Inwardly I groaned, not because I don’t like Valentine’s Day, but because that means that Jordan’s birthday is super close and I need to start planning her party and her birthday and all the things that come with it. Given the fact that she’s turning 13 and I also started wondering how middle school handles Valentine’s Day. I’m assuming that the days of boxed valentines for the whole class are over? That if she comes home with cards and candy it’s from her friends…or a boy?! I better stop there because one, I can’t think about it and two, if she reads this she will literally kill me when I sleep. Let’s segue into COOKIES, mmkay? 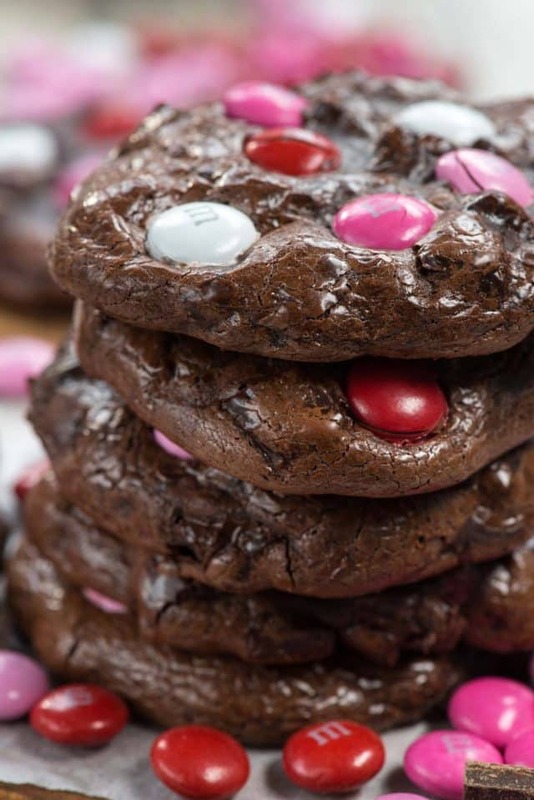 Fudgy Brownie Cookies full of chocolate that are PERFECT for Valentine’s Day! I mean, really, look at that picture. Can you see how fudgy they are? It’s like eating a brownie in cookie form. It’s like a miracle. Not only are these cookies super fudgy, but they’re also accidentally gluten-free. They are made without flour and instead use cornstarch for binding. These are reminiscent of a flourless chocolate cake but they’re crackly outside makes them like a brownie. I know a lot of people make brownie cookies from a box, but these are from scratch. There are lots of recipes for brownie cookies out there (I have several of them, lol) but these have just a few simple ingredients: powdered sugar, cocoa powder, cornstarch, and egg whites. I also add a hefty dose of chocolate chunks, but you can make them without chocolate chips if you prefer. Then I add the M&M’s to make them pretty. I’m a sucker for any of the seasonal M&M’s, and these cookies would be so pretty decorated for Easter, Christmas, 4th of July, or even with just plain old regular colored M&M’s. 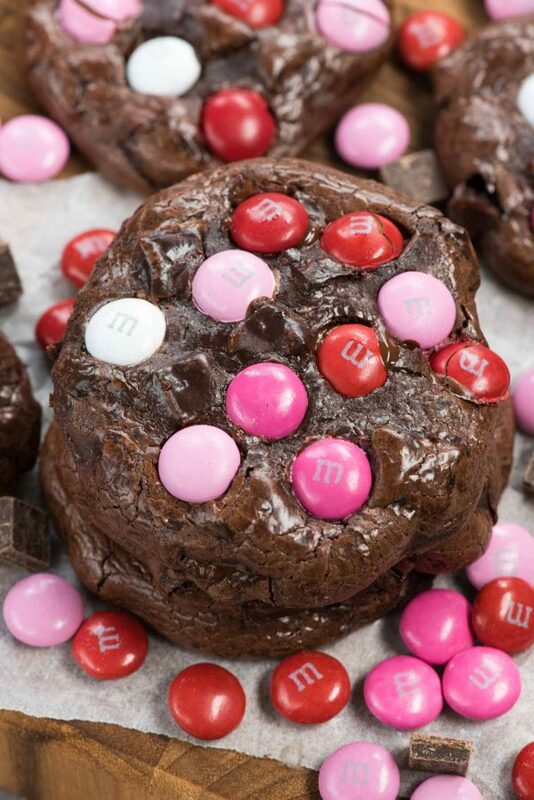 Fudgy Flourless Brownie Cookies are perfect for Valentine’s Day with colorful M&M’s on top! Skip the flour and use cornstarch! That makes these gluten-free and also soft. Powdered sugar makes them nice and soft, and adds some chewiness as well. I love using baking chunks but you can use chocolate chips, or omit them all together. This recipe is a smaller batch – just about 10-12 cookies. They’re so rich that it’s enough! The dough takes a while to stir together, but don’t give up. Simply drop and bake and they’re perfectly delicious. If you’re ever craving fudge but want a cookie, this is the recipe for you. They’re the perfect recipe! 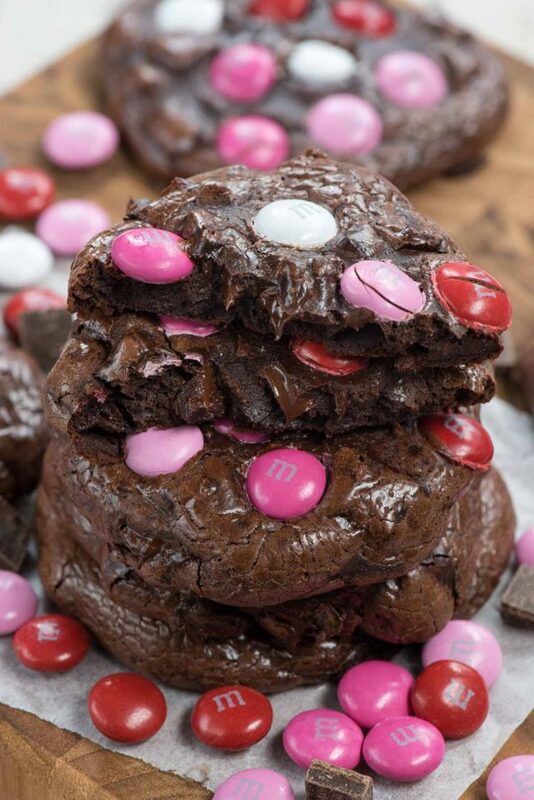 Make Valentine's Brownie Cookies for your valentine! These fudgy brownie cookies are flourless and super chocolatey and perfect for any brownie lover. Whisk together the powdered sugar, salt, cocoa, and cornstarch in a large bowl. Add egg whites and vanilla and stir until a thick mixture forms. It will look like it’s not enough liquid - just keep stirring, but do it carefully so you don’t spill cocoa mixture all over the place. The batter will eventually come together. It’s very, very thick. Stir in the baking chunks and nuts, if using. Scoop 2 tablespoon sized balls of dough onto the cookie sheets, leaving a few inches between them. Place M&Ms all over the top of the cookies. The cookies will spread, so add as many as you can fit (about 5-7). Bake for 11-13 minutes until most of the cookie is no longer glossy. There may still be a spot or two of glossy in the center. Let cool completely before removing from the pan using a spatula. Store in an airtight container for up to 3 days. The *TEXTURE* on these things. They look perfect! I have a recipe for flourless brownie cookies that I made years ago and still remember the big time fudge factor but yours take the cake! Or the brownie 🙂 I love how extremely fudgy and chocolaty they are! And yes V-Day is so close! I made the valentine brownie cookies and they were flat as a pancake. The mixture was really thin. Not like your video. They had a good taste but if I had cooked them til the shine was gone they would have been burnt. I’ll try again though. Thanks for your inspiration and encouragement.